As a fairly active person who spends more and more time outdoors, I hear a lot about Lyme Disease. It's commonly associated with people who go hiking, camping, or participate in other outdoors activities. So what exactly is it? Simply put, Lyme Disease is a bacterial infection typically transferred by tick bites. There are three strains of bacteria from the Borrellia genus that cause this infection, though they are not solely spread through tick bites, they are all carried by ticks and tick bites are the most common way that they spread. In Europe and the Americas, there are over 10,000 cases of Lyme Disease being diagnosed every day, which makes this one of the most widespread infectious disease in these countries. Not every tick bite will transmit this bacteria, but it's good to watch out for the signs of infection if you ever find a tick on your person. One of the first signs (in about 70%-80% of the cases) is a rash starting around the area of the tick bite. It is usually bulls-eye shaped and accompanied by pain, inflammation, flu-like symptoms, fatigue, and/or muscle and joint aches. In rare cases it can cause hepatitis (inflammation of the liver), meningitis (inflammation of the protective tissues in the brain), and can weaken the immune system to allow for co-infections such as herpes. If caught early, this infection is easily treated with antibiotics. However, if allowed to continue it could cause problems with the nervous system or heart. There is also a chronic form of Lyme Disease that can cause health problems years down the road. Chronic Lyme Disease can effect quite a few systems in the body including the digestive system, the reproductive system, the nervous system, the skin, muscles and joints, and even the heart. 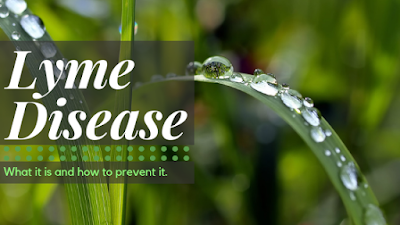 Quite a few of the symptoms of Lyme Disease are found in other diseases as well, so there are more than a few cases that have been misdiagnosed or even gone undiagnosed. Make sure that if you have these symptoms, especially if you've spent any time outside recently, you check with your doctor about the possibility of Lyme Disease. Lyme Disease is easily treated with antibiotics, but there are some natural alternatives out there as well, but make sure to talk to your doctor before starting any natural treatments and the more extreme cases of this infection can cause major health problems for years after it's contracted. Diet is one of the best places to start, and can be helpful even if you go the pharmaceutical route. One of the first steps is to cut back on processed foods, especially those that are super high in sugar. Make sure that you stay hydrated, the bacteria that causes Lyme Disease releases toxins into your blood stream, drinking a good amount of water daily will help eliminate those toxins more effectively. Most people recommend drinking 2 liters of water a day when you have Lyme Disease. Try going gluten-free. Gluten can cause inflammation in your body, in the same areas that Lyme Disease causes inflammation. You could also try drastically reducing your carbohydrates. This can help keep your digestive system running smoothly, helping to reduce the effects of Lyme Disease on your digestion. However, there is one thing that you want to look to add to your diet if you have Lyme Disease. Coconut oil is antibacterial, antiviral, and antifungal. It helps to boost immune function and can help improve your circulatory functions as well. Make sure you get cold-pressed, unrefined, coconut oil to get the most of this amazing oil. While pharmaceuticals can treat Lyme Disease there are some herbs that can help manage the symptoms and some that may even work on the infection itself. Some immune boosting herbs are great for the early stages of Lyme Disease, these include astragalus, elderberry, and olive leaf. However, some of these may not be very effective during later stages, or for chronic Lyme Disease. Herbs such as clove and oregano are naturally antibacterial and will work specifically on the bacteria that causes the infection. Mushrooms such as chaga, reishi, shiitake, and cordyceps have shown quite a few positive results helping to mitigate symptoms and to fight the infection itself. Of course, when dealing with infections, the best medicine is prevention. Lyme Disease is no different in this regard. When spending time outside, make sure to wear protective clothing (long sleeves, pants tucked into boots, etc) and to stick to areas with short grass, avoid tall grass and underbrush. Wear insect repellant. I make my own, and I always add lavender essential oil to it because lavender repels ticks very well. Make sure you check yourself, your family, and your pets for ticks whenever you spend any time outdoors. Make sure that if any ticks are found, you remove them safely. I hope I have helped you understand more about Lyme Disease. If you would like to share any questions, comments, advice, or experiences, please leave them below.